1) Lighting: The first tell-tale sign that a product photo has been taken by an amateur is poor lighting. The best light source for your images is always natural light. You can certainly play around with a light box and lamps and get great photos, but natural light is the easiest light available. You do not have to worry about harsh shadows or off coloring in your photos. Two tips for photographing jewelry using natural light are, stay away from direct sunlight and try to have the sun behind you and not in front of your camera. If you are shooting your photos outside, choose a shaded area that is close to the direct sunlight. When shooting indoors, again move your work right next to where the light is streaming in or block part of your window with a sheet of white paper to soften the light. I like to photograph by a west facing window in the morning or an east facing window in the afternoon so that the light is strong, but not directly shining on my work. You can also adjust your camera to let more or less light in depending on the amount of natural available light and what kind of background you are shooting your product on. Black will soak up more light, which means you will need to let more light into your camera when shooting on a dark background. Just remember in order to keep your photos looking professional, never take shots of your products with the sunlight shining directly on your work. 2) Focus: The second giveaway that a photo is amateurish is poor focus. It always surprises me when I see photos on a blog and the images are really out of focus. There is nothing that speaks more unprofessional in a photo than having a blurry image. In the next two tips for photographing jewelry I will share more on how to get crispness in your product photography. First I have one little tip to make to help you get a good focus. The closer you get to your image the harder it can sometimes be to get a clear focused shot. Try taking your photos a little further back on the highest quality setting that you can. Once you have loaded your image onto your computer you can crop the image nice and close without the trouble of getting in really close with your camera. 3) Use a Tripod: When you are photographing small items it can be difficult to take close shots and maintain a still camera. You may find that your photos end up looking blurry. I am not fond of setting up a big old tripod to take pictures of little tiny things because it is so hard to maneuver a tripod close to where you want to take the shot. It certainly does not lend itself to taking images from all different angles. I highly recommend buying a flexible and small sized tripod such as the Joby Gorilla tripod as it will let you get in nice and close to your subject because of it's flexible legs. 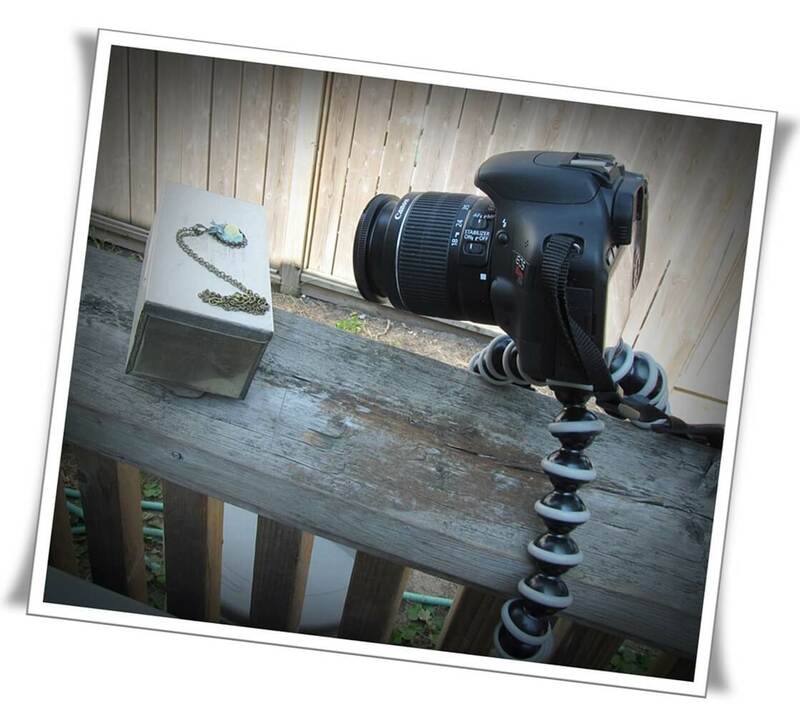 You can also wrap the legs around objects to secure the tripod in front of your photographing area. Make sure to choose a tripod that is designed for the weight of your particular camera. 4) Use a Shutter Release: Here is another handy must have gadget for taking crisply focused product photos. A shutter release will also ensure that you are not accidentally shaking your camera when you take your photos. Between the tripod and the shutter release you should be able to get a sharp focus every time. 5) Add Interest: Now that we have covered some easy fixes for getting your photos looking top notch, we can focus on creating a little allure. There are lots of ways to create interest in your photos such as shooting from different angles, making a necklace chain fade off into the distance or creating one focal point that stands out from the rest of your image. Learning how to photograph jewelry that creates impact is all about styling. Photo styling can be achieved in a few different ways. First we can look at supporting materials such as backdrops and props. Experiment with various backdrop papers with subtle textures or patterns, hard surface textures such as slate or weathered wood and decorative fixtures such as vases or weathered tin that you can lay your items on. Next, add styling in how you prop your jewelry by slightly resting one earring upon the other, creating movement in the chain or propping a ring on an angle with a little putty behind it holding it in place. Rather than taking a head-on shot of those earrings lined up parallel to each other, you can give them character in the way that they rest on your props or even against each other. Lastly, you can add interest to your photos with photo editing software using various overlays or special effects. While you don't want to go overboard with special effects, you can add a vintage feel or vignetting to your photos by using free photo editors such as PicMonkey and PhotoScape. Before you know it you will have a style of your own that speaks your special brand. There you have it. Five simple tips for photographing jewelry that will speak volumes about your brand! Return from 5 Tips for Photographing Jewelry to How to Sell Jewelry Online.